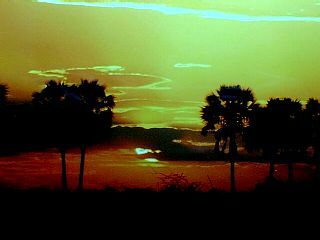 Namibia really is one of Africas gems. 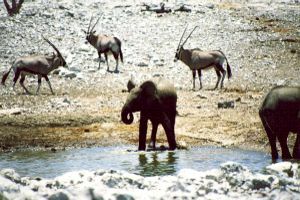 The scenery alone throughout this vast country is awesome but the highlights have to be the dunes at Sossousvlei and the spectacular sight of the animals at Etosha National Park (especially at Halali waterhole). The city of Windhoek is worthy of a visit. The border formalities were so easy it was incredible. One form and we were through. No carnet stamp was required due to the common customs union between Botswana, SA and Namibia. There was no vehicle check and no gift request - just "enjoy your stay in Namibia". It was all so easy that we forgot to buy 3rd party car insurance. Despite being dark we continued along good roads to the Ai Ais resort in the Fish River Canyon. Daylight revealed fabulous scenery in the canyon - surrounded by orange rocks. Our first port of call was the pool containing piped water from the natural hot springs. We soaked in the gloriously warm water for an hour before having a superb full English breakfast followed by a brief walk into the canyon. Back on the road we drove to the Hobas lookout point to see the canyon at its most impressive location. That night we reached the extinct volcano crater at Brukkeros via a very interesting 4x4 road. It was a fabulous location for bush camping, high up with views across miles. 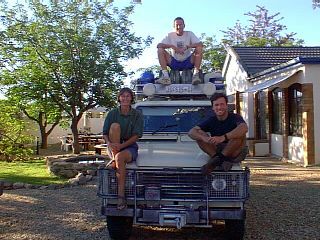 We all had a fun braai that night when we named Gordons Landy "The Comet" as it's full of dust, ice and gas, just like the real things. Didn't get much sleep that night because my arm was throbbing from a tsetse fly bite. Andrew developed an allergy to one of the anti-malarial medications and the skin on his hands, face and feet started to fall off making him look particularly handsome! Talk about the pair of us being in a right state. After a day of driving we eventually reached Sesriem where we were told that the campsite was full. Officially you are meant to book all the parks and camping areas via a central agency but we couldn't be bothered. Once they knew that we were self-sufficient in the Land Rovers they agreed to put us up next to the toilet block. Better than nothing! We headed off on the 64 km journey to the dunes for which Sossusvlei is renowned, for sunset. 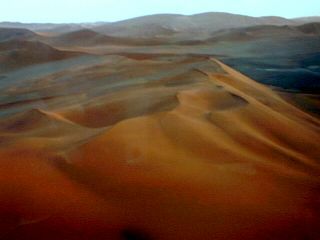 These dunes apparently feature in a number of films and adverts. We had to deflate the tyres to get through the sand which took up a bit of valuable time but the view was worth it. The dunes were huge and stunning. 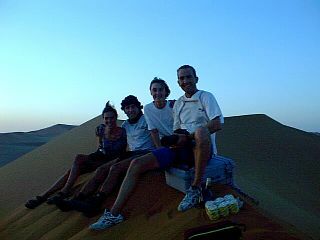 We only just managed to reach the top of one of the dunes in time for sunset where we celebrated with G&T's. The booze delayed us and by the time we reached the park gates they were shut. The curfew meant that we had to camp in the park next to the gates but at least we weren't next to the loo block. The down side of camping at the gates was that we were disturbed by the overland trucks going past at 5am to get to the dunes for sunrise. We eventually got up and managed to reach Dune 45 for sunrise then spent a day doing nothing under a tree in the hammock in the middle of a dune field. By 5pm the temperature dropped sufficiently to go on walkabout around Dead Vlei. This set of dunes was far more spectacular than the Sossusvlei set and the changing colours of these pristine dunes was an incredible sight. 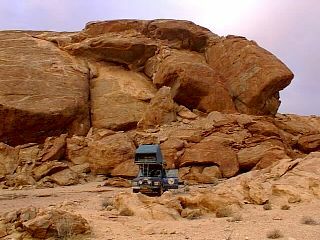 Saturday 15th October took us north into the Namib Naukluft Park where we first visited the impressive Kuiseb Canyon followed by a bush camp at some rock formation near Gobabeb. No one was around to check our non-existant park permit or camping permit. Given that there were two official camping spots and five groups of campers we weren't the only ones without the documentation. The rock formations proved to be a challenging climb with the exfoliations making for a tricky but fun descent. Walvis Bay is a strange town. It is chilly and covered in sea mist. It is incredible to think that the Sossousvlei dunes are not that far south. It is a sleepy place but we managed to get everything we needed and the fish restaurant out on a jetty was lovely. There wasn't an awful lot to keep us in Walvis Bay so we hit the sandy highway north to the Welwitschia Drive. The area is vast, painfully dry and full of shifting dunes. Such a desolate place. That evening we did book for camping but the site turned out to be a flat bit in the sand and had no-one to check the permits. In the morning we drove around the park to see the 1.5 thousand year old Welwitschia plants. They are fascinating. Measuring about a metre or two in diameter they are formed from two leaves which get torn by the wind so it looks as though there are many leaves lying as if they are feeling sorry for themselves. Afterwards a visit to the famous "moon landscape" wasn't very exciting. It resembled a lumpy canyon. A brief stop at Swakopmund to stock up on food and confirm with the tourist office that we didn't need to book camping sites at Etosha and we were on our way to the Cape Cross Seal Sanctuary. What an excellent place - thousands of really really smelly seals just lazing around. A jackal caught a baby seal and all the other seals were too busy sunbathing to notice or care. Campsite Mile 108 was barren and had a generator for background music. However this turned out to be the place for a fantastic chilli with wine and provided an opportunity to clear a load of rubbish out of the car as we were able to make camp quite early. 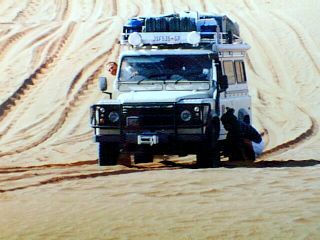 We were up at the crack of dawn after a really cold night because we had a long drive ahead up the Skeleton Coast Park. It is supposedly an area of fascination and fog where shipwrecks are common and sailors come to their gruesome deaths. The coastline is meant to be littered with shipwrecks. It is essential to buy a park permit for £6 per car just to drive through the park. We had a clear day and saw two pretty dismal wrecks and miles and miles of sand. Not even any desert elephants! The nature programmes of this area must be filmed in the restricted areas in the north - the area reserved for "fly-in" passengers! For a bit of excitement we decided to go down a no-entry track where we found a beautiful waterhole but without any wildlife. We had anticipated spending the whole day in the park but could only find enough to do for a few hours. Once outside the park the scenery became spectacular. The mountainous inland roads followed the contours of the mountains and provided a fun drive. There was quite a lot of dust though and Punda and Comet took turns to lead so we all took a share of dust chewing. In this country the cars get filthy. Passing orange, red and bronze mountains we arrived at Twezelfontein where some of the best African artworks can be found - apparently! Hum - lower primary school standard. 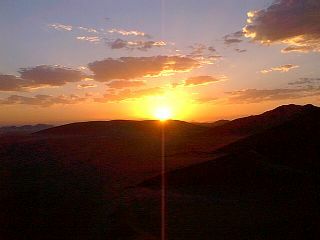 Burnt Mountain was described in the book as a glowing slagheap. I would be inclined to leave out the glowing part. It was dreadful so we quickly headed for Palmwag Lodge which turned out to be an oasis amongst little else. That night we cooked a fabulous peppered steak on the braai. Gordon really does have a knack of getting the braais going. We had originally planned to go to Sesfontein and visit its fort but the comfort of Palmwag kept us there for another night. After a day of chores on both cars, including an oil change for Comet and a fight with a particularly stubborn oil filter we had a chicken curry with a lovely bottle of wine followed by marshmallows toasted over the braai. 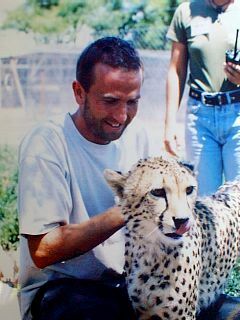 The cheetah farm at Kamanjab was a very touristic affair and the twenty or so Spaniards with us were a bit of a pain. They kept nattering and walking in front of the cameras. 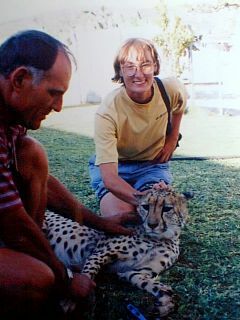 We all had to jump into a backie (truck) to be taken to visit four tame cheetahs where we could stroke them. They were quite rough and greasy - a bit like an old dogs coat. 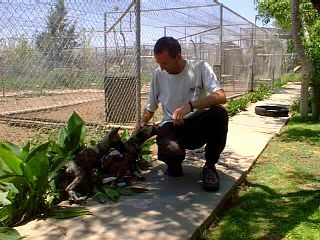 Afterwards we were taken to see about 30 semi tame cheetahs and watched them being fed with donkey parts. 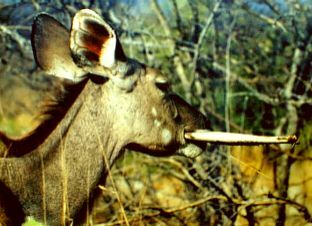 A tame kudu roamed the campsite and pinched my apple off the dashboard along with anything else that was available. It was such a nuisance but fun at the same time. 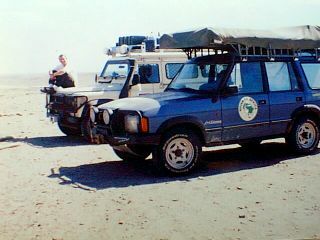 The next day we finally made it to Etosha. We had planned to spend two nights in each of the three campsites. Unfortunately the first one was full and they weren't going to budge on that because we hadn't booked! So much for the tourist office advising us that we didn't need to book. A brief look at the watering hole at Okaukuejo supplied the first opportunity for me to see wild elephants. What huge and magnificant creatures. 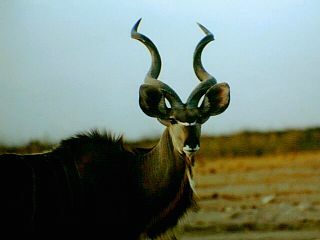 The drive to the second camp at Halali took us past a number of springbok and wildebeest. This is a vast place and we were hoping that we would see quite a lot of action around the watering holes. After a relaxing dinner we made our way to the watering hole at the campsite. 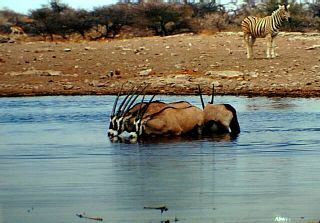 This must be the most incredible watering hole in Africa. 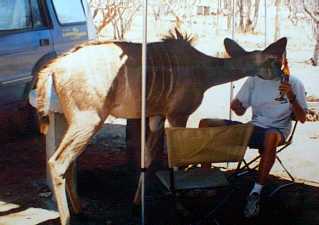 You sit on elevated rocks or chairs and just watch the animals drink literally a few metres away from you. There is a light that shines over them so you can get a good view. We sat in silence with mouths wide open as 25 elephants and a black rhino sauntered in. 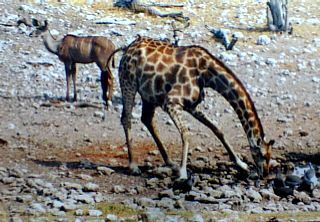 The next few days at Etosha were quite tiring. We spent a few days at Halali then another few at the Namutoni camp. 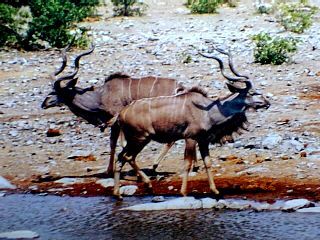 It is essential to get up early (5.30am) to get to the waterholes before it gets too warm for the animals. After a few hours you return to the camp to relax before going out again on an evening drive which is always more spectacular as the light is better and more animals are found drinking after the heat of the day. That is if the lions aren't around. You have to be back at camp before 7pm as they shut the gates but you can sit at the camp watering hole all night if you wish. It is difficult to tear yourself away at midnight because you are always waiting for who is coming in next and whether the elephants are going to have another fight. We saw so many animals over a few days it was amazing. The last evening game drive was excellent. First we followed a rhino blocking the road doing about 3 mph then we met four lions (one big male) whilst driving down a road. They were literally at the side of the road about 3 metres away. They were going to the waterhole about 1 km away that we had just left so we dashed back and got the best position for viewing the confrontation between the approaching lions and the elephants who had been drinking happily. We couldn't contain our excitement as we hung out of the car with cameras and videos awaiting the approach. 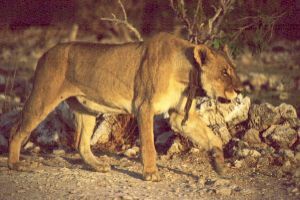 Lions really are the "kings of the jungle". They just walk along in a regal manner, frighten off whatever else is around and take over the waterhole. Even the elephants budge. Sadly it was approaching 7pm and the five or so cars all left in convoy with four minutes to travel the 8 km back to camp - at a maximum speed of 60km per hour of course! On Thursday 28th we took the long 530 km drive to Windhoek. The Landys don't go fast so it took nearly all day. The Roof of Africa Backpackers was fantastic and provided all the necessary communication facilities required. Windhoek, the capital of Namibia is great. It is a lovely compact town, it is very clean and there are plenty of coffee shops selling zachertorte. This is what I came here for! That night we treated ourselves to a delicious dinner at a Portuguese restaurant and made plans for the journey through Botswana. 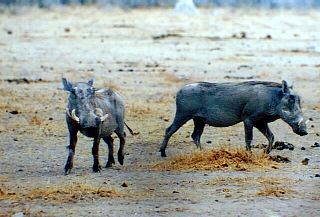 It wasn't far to the border with Botswana but we decided to take a detour and visit the Harnas Animal Sanctuary. What an excellent place. You pay about eleven pounds each for camping and that includes three tours. The evening two hour tour took us around in a truck to feed a number of animals including the predators. 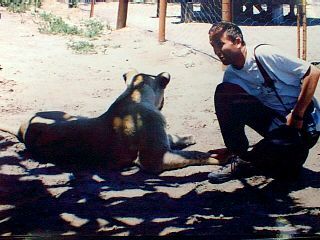 The sanctuary is huge and the animals are caged for their own protection. 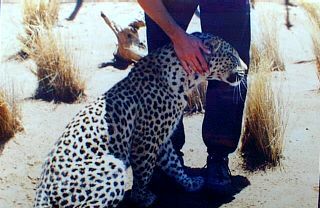 All the animals visited that evening were semi-wild including lions which were fed on smelly intestines; three legged wild dogs; hissing caracals that can leap 2m into the air; vervet monkeys...etc. After an enormous and impressive electrical storm which lasted about an hour or two we went on a fun tour of the nocturnal animals where we walked with hyenas. These are such odd looking creatures which have ferocious jaws. Walking amongst them was so exciting. The morning 2.5 hour walking tour was an absolute delight. We saw, fed and touched so many animals including cheetah, lion, leopard and wild dog. The leopard was incredibly strong. As it curled itself around my leg it nearly pushed me over. Its coat was so beautiful - much softer than the cheetahs. There were even meerkats to be played with! After lunch we left Harnas and at just after 6pm said "goodbye" to Namibia as we headed for Botswana. What about the main things in life, all its riddles? If you want I will spell it out for you right now. Do not pursue what is illusory - property and position: all that is gained at the expense of your nerves, decade after decade and is confiscated in one fell night. Live with a steady superiority over life - don't be afraid of misfortune, and do not yearn after happiness: it is, after all, all the same: the bitter doesn't last forever, and the sweet never fills the cup to overflowing. 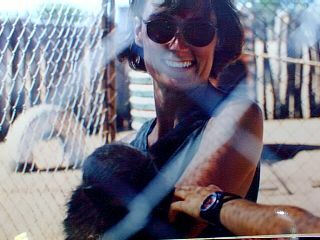 Jac finds a baby monkey that needs a cuddle Can I take one home please...oh please... 'I'm from Scotland you know .........we're not very tasty' Who says leopards are shy You never get this close - wow !! Namibia is an ex German colony so you can get masses of sausages and zachertorte. Namibia is incredibly easy to travel around. The population is so low that you hardly see anyone, except tourists. If you forget to buy 3rd party insurance at the border you cannot buy it elsewhere. Currency is the Namibian dollar which cannot be used in any other country. They also take South African rand at a rate of 1:1 so I wouldn't bother with the dollars. 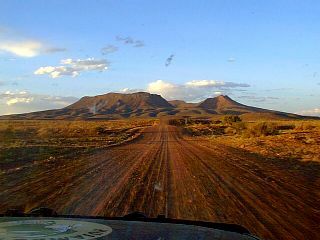 There are not many tarred roads - most are gravel although corrugations do not pose much of a problem. Distances are vast so plan wisely with fuel. It is illegal to bush camp and you are supposed to book ahead at the central tourism offices for your campsite. All the areas that tourists may be interested in have been declared "parks". Therefore you have to have a park entry permit and book and pay for your camping - even when they have no facilities. With the exception of Windhoek and Swakopmund there are few supermarkets. 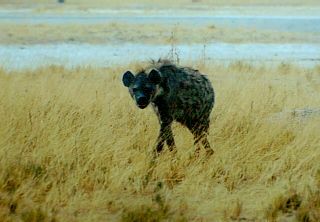 The camps at Etosha are supposedly well equipped - it varies. At the time we were there you could have had a feast at Namutoni but starve at Halali.